Professor Valentine earned her B.S. in Chemistry from the University of Virginia. She conducted undergraduate research with Timothy Macdonald on aluminum inhibition of magnesium-dependent enzymes. After graduating in 1993, she went to MIT to earn a Ph.D. with Steve Lippard. She then conducted her postdoctoral research at Penn State University and, in 2001, joined the Yale Departmet of Chemistry faculty. Her research explores the use of metals in nature and the development of potential titanium-based anticancer drugs. 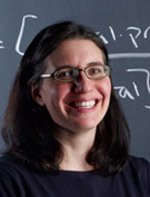 She has received numerous awards including the American Chemical Society PROGRESS/Dreyfus Lectureship Award in 2007 and the Paul D Saltman Award for Metals in Biology in 2009.